Madigan made… blooming flower pot gift card holders (video). A live video tutorial for Mother’s Day…. brought to you in part by DecoArt. Most of the mothers I know always appreciate a handmade gift. Even a simple present like a gift card can be elevated with creative, homemade packaging. This week I am teaming up with a bunch of other creative bloggers and DecoArt to show you what you can make for Mom this season. DecoArt sent us all some of their craft paint to make something for Mother’s Day. Paint the inside and outside of the pot with paint. Fold a piece of paper around the gift card and slip it into the wire holder. Give your cute gift to mom! See? So cute and simple to make! Want more Mother’s Day inspiration and video tutorials? 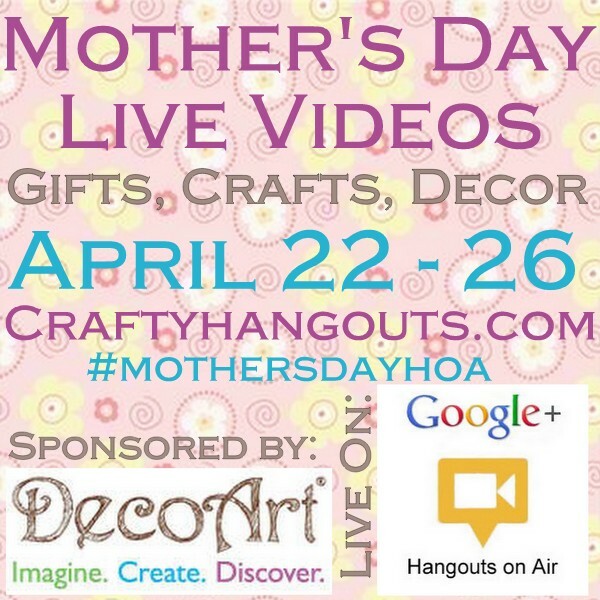 Head on over to Crafty Hangouts to watch all of the crafty videos going on this week or follow the hashtag #mothersdayhoa. Note: I was sent complimentary product for this project/video. All opinions are my own.